There is a nice bit of Silver Peppermint (Eucalyptus tenuiramis) woodland near the Cascade Brewery which I love checking in on. This year I thought I’d go up and have a look around in the hope of seeing some orchids, particularly the Dark Caladenia (Caladenia atrata) and to relocate a very small species of Leek orchid (Prasophyllum sp.) which I had seen a couple of years ago. Alas, it was not the right time – there were no orchids in sight. The bush didn’t let me go away empty handed however. The Starry Appleberry (Rhytidosporum procumbens) was in full flower. It’s not a very big plant but the white flowers are unmissable. 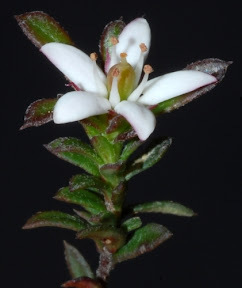 It’s sometimes hard to imagine that this little shrub is a relative of Tasmania’s Pricky Box (Bursaria spinosa). The Blue Lovecreeper (Comesperma volubile) and Peachberry Heath (Lissanthe strigosa subsp. subulata) were also getting started. This twiner would easily be mistaken for dodder (Cassytha sp.) when not in flower. It wasn’t long before the bryophyte bug bit and I started getting distracted by some of the fruiting bryophytes around. In particular, there were some delightful capsules and antheridia (male reproductive parts – pic left) of Breutelia affinis and some fruiting Fossombronia. There are new wonders every spring, even in places one has frequented. I’ll be back again for sure. 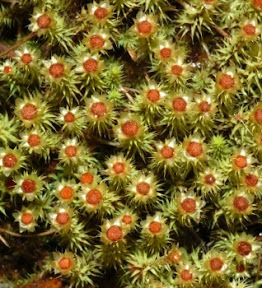 This entry was posted in Rambles and tagged 7th Oct 2008, Blue Lovecreeper, Breutelia affinis, Bryophytes, Cascade Brewery, Comesperma volubile, Fossombronia, Lissanthe strigosa subsp. subulata, Peachberry Heath, Rhytidosporum procumbens, Starry Appleberry. Bookmark the permalink.